Equities staged a late day rally during Friday’s final 30 minutes of trade, more than fully erasing earlier losses in the session. Investors remain hopeful that President Trump’s first address before a joint session of Congress will provide details surrounding his tax and healthcare reform plans. Friday’s reversal preserved the ongoing series of daily gains on the Dow Jones Industrial Average, closing at fresh all-time highs for the past 11 sessions, its longest streak of records since 1987. The so-called ‘Trump reflation trade rally’ has lost some momentum recently as Wall Street wrestles with political uncertainty in the U.S. and France. The potential for a quickened pace of interest rate tightening has also challenged investor sentiment. For the holiday-shortened four-day week, the S&P 500 climbed by +0.73%, the Dow Industrials advanced +0.96%, and the MSCI EAFE (developed international) fell -0.14%. As shown in Chart 1 above, the Eurozone’s preliminary February all-industry composite activity Purchasing Managers Index (PMI) jumped to a near six-year (70 month) high of 56.0, suggesting the pace of the growth across the European Union improved markedly. Indeed, the increase was broad-based across countries and components. 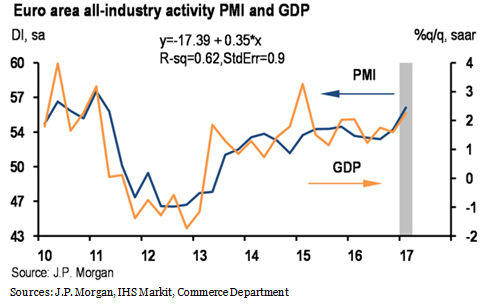 According to J.P. Morgan, the PMI reading would be consistent with about 2.5% annualized GDP growth. The firm is cautious about placing significant weight on one month’s reading, but the increase was large enough (and supported by national surveys) to prompt an upward revision to their first-half 2017 growth outlook. Their revised forecast has growth at 2.25% in the first quarter and 2% expected for the second quarter.